PSJA North (4-3, 3-1) and RGVSports No. 9 La Joya High (5-1, 3-1) have one district loss in 30-6A, both to undefeated No.4 PSJA High. Outside of those losses that came on consecutive weeks, Week 5 for La Joya and Week 6 for PSJA North, the two programs have been impressive in their district outings. When the 6A districts were shifted and realigned in February, there was a chance for excitement in 30-6A. The top two PSJA ISD schools stayed in 6A but moved from 31-6A to 30-6A, where the McAllen schools, Mission High and the two biggest La Joya ISD campuses awaited. Through four games of district competition, the race has not disappointed. McAllen Memorial’s reign has been challenged, the Mustangs have lost to La Joya and PSJA High. North’s improvement from their 2-8 season a year ago has come at the cost of teams with playoff hopes of their own. La Joya Eddie Villarreal tries to fend off a face mask by McHi Chis'mere Mallard in the first quarter at McAllen Veterans Memorial Stadium on Thursday ,Oct. 11, 2018, in McAllen. 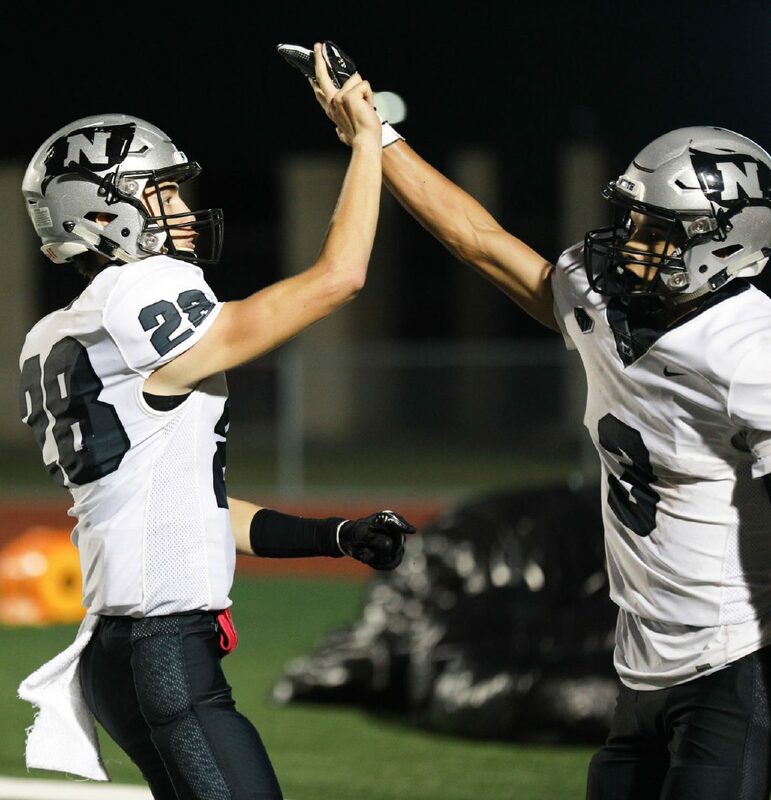 PSJA North's Anthony "smiley" Rodriguez (28) celebrates a touchdown with teammate Arturo Beltran (3) in the first half in a game against PSJA High at PSJA Stadium on Friday Oct. 5, 2018, in Pharr. In Week 9 there is an impasse. The two teams with 3-1 records meet to see who can stay hot on the heels of the Bears,and in second place. La Joya’s run game will be key again. Eddie Villarreal has led the Coyotes to wins in their last three games with 100-plus yard performances in each contest. He scored seven touchdowns in those three games and has 16 on the season. When quarterback J.R. Rodriguez gets loose, he is a threat to take it all the way in the triple option, he has five rushing scores this year. With a narrow 29-28 win over McAllen Memorial at home and shutout victories over McAllen High and rivals La Joya Juarez-Lincoln, the jewel of the Valley is rolling. 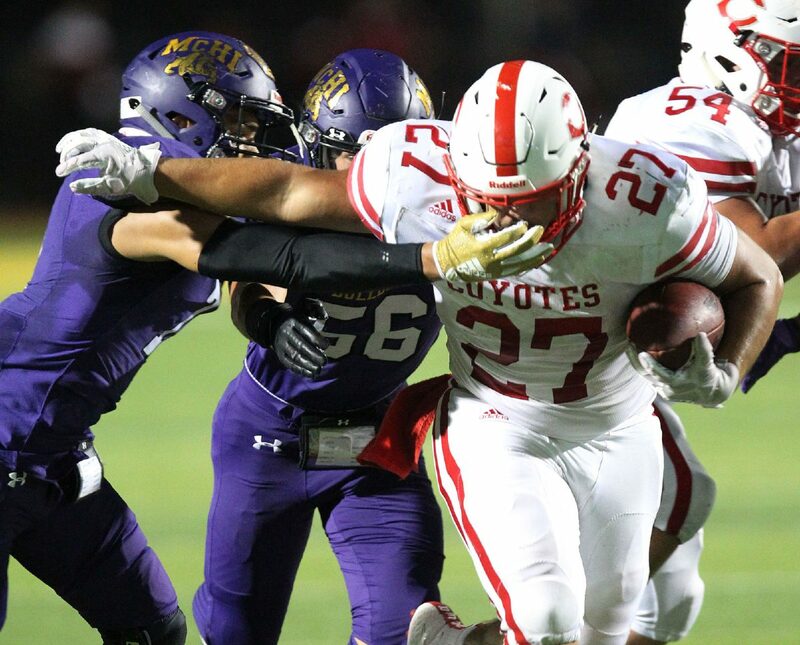 Since handing the Mustangs their first league loss in nearly five seasons, the Coyotes are back to the ground-and-pound offense combined with a strong defense that has characterized coach Reuben Farias’ teams for the past two seasons. PSJA North is in a similar situation, riding high on confidence thanks to strong wins at key points in the season. The Raiders won their district opener in comeback fashion against Juarez-Lincoln and lost by only three points to PSJA High. The 10-7 loss was a surprisingly low-scoring result between two teams full of talent on offense. North didn’t let the loss to a fierce rival turn into a major setback. Instead, the Raiders bounced back big against McAllen Rowe in Week 7. Coach Marcus Kaufmann’s group turned a weakness into a strength and won the turnover battle to beat the Warriors. Arturo Beltran scored four times to torch Rowe for a 38-22 win. Beltran was all over the place again last week against Mission High in the Raiders’ 41-31 win over the Eagles. He had 88 yards rushing with two scores and 69 receiving yards with a long receiving touchdown. The smash-mouth Coyotes’ defense will have to deal with Beltran and freshman running back Isaac Gonzalez, who had 121 yards on the ground and a score to go with 31 receiving yards and another score. The Raiders defense has stepped up as well. Seven Sanchez had an interception and fumble recovery and Aaron Alvarez had three sacks against Mission. La Joya and PSJA North kick off at 7:30 p.m. Friday at PSJA Stadium in Pharr.